The last week has been really revolting on the vertigo front. The air pressure due to thunderstorms developing ( we were really lucky and avoided them but it was so hot and sticky!) made my ears misbehave leaving me with a couple of days where I felt like I was constantly spinning. Despite all that I have still managed to get some sewing done and even give a lesson to a dear friend of mine. I am having to write this post uber early (Sunday evening) as on Wednesday, which is usually blog post writing day, I am on a course to learn how to use my over-locker. I am already starting to panic that a day learning on a course is probably going to be too much for me, probably? Who am I kidding? This will floor me especially when my health isn’t great due to this ear problem. I have had to grab whatever moments I can to do sewing this week as quite a lot of the time I just haven’t been able to. Thursday I had to quickly prepare fabric ready to teach my friend Imogen some basics on the sewing machine. I decided for her first lesson I would have her make an envelope back cushion cover. I decided that having her sew straight lines on calico would probably drive her around the twist. 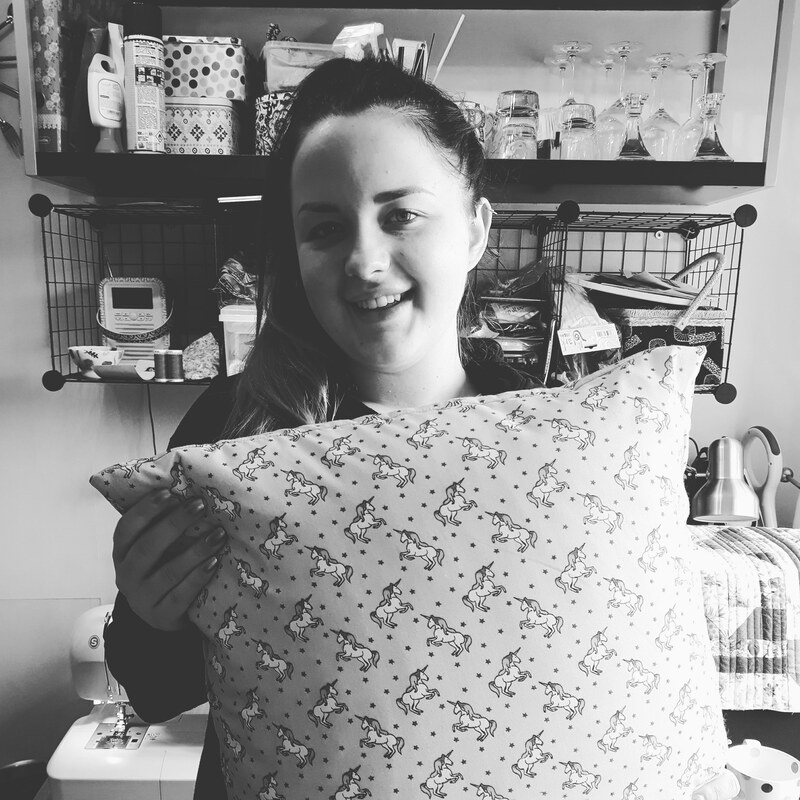 Imogen is naturally creative and she thinks like a sewist. I decided I would cut out all the fabric out for her and overlock all the edges. All Imogen would then have to do is sew some straight lines and she would come away with a finished item. I finished all the prep work and then ended up going to bed as the vertigo became so bad I couldn’t walk in a straight line. On Friday Imogen came for her lesson and our bi weekly catch up. I got her to practice rectangles to begin with on some calico as she would need to know how to pivot the material keeping the needle down. She did really well so I let her loose on the material – pink with unicorns. She did a fabulous job and I tried very hard not to be constantly leaning over her by playing on my phone. She was so surprised when she had finished sewing it and genuinely pleased with herself. She did a fantastic job. Although she will probably kill me for posting this photo! I was exhausted on Friday night and was asleep before 7.30pm. I also managed to forget to take my evening meds which meant I went into withdrawal, thankfully it wasn’t as bad as it was last time when I wrote about it here https://wp.me/p4zBAs-m6 but it left me feeling pretty off colour all of Saturday. 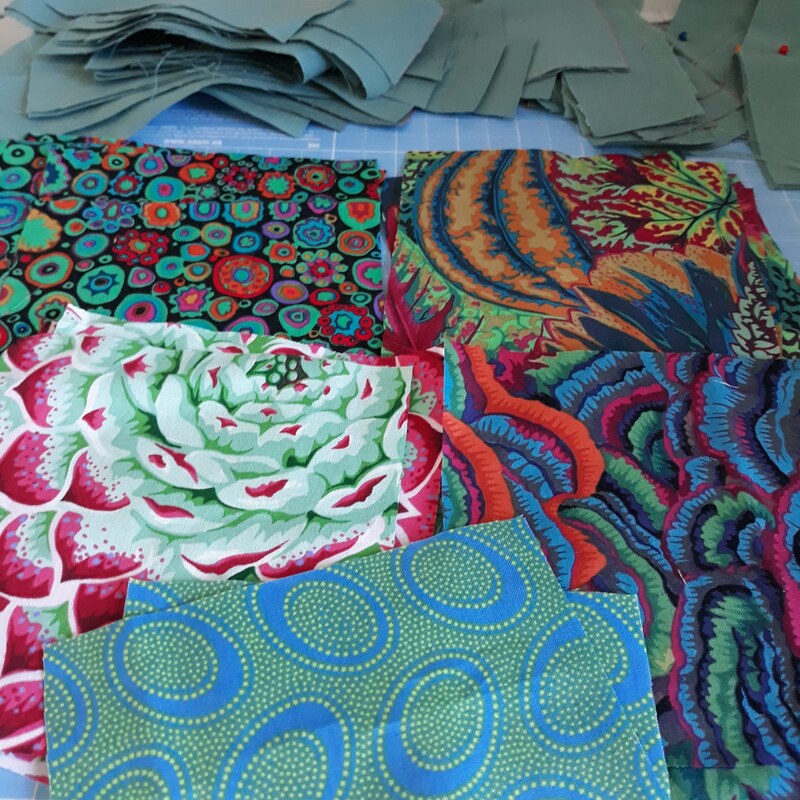 However I still managed to get the rest of my fabric cut for my Kaffe Fasset / Free Spirit fabric quilt. 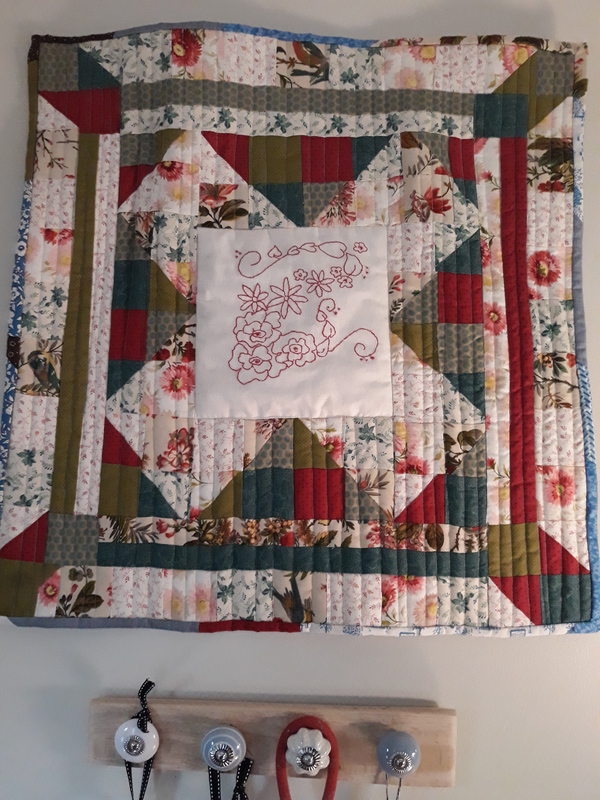 Today (Sunday) I have finished my wall hanging that has been waiting to be completed since it arrived in April. 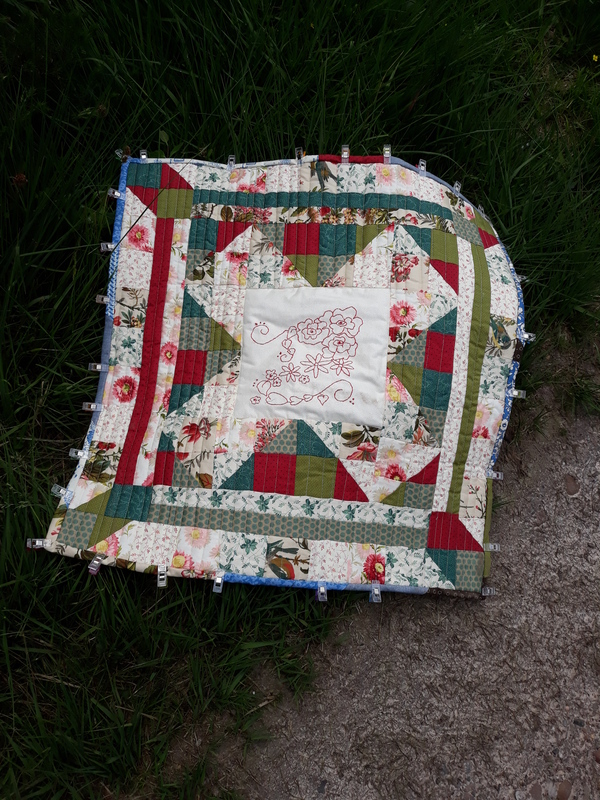 During the week I quilted it. This left the scrappy binding to make and then attach both tasks completely new to me. 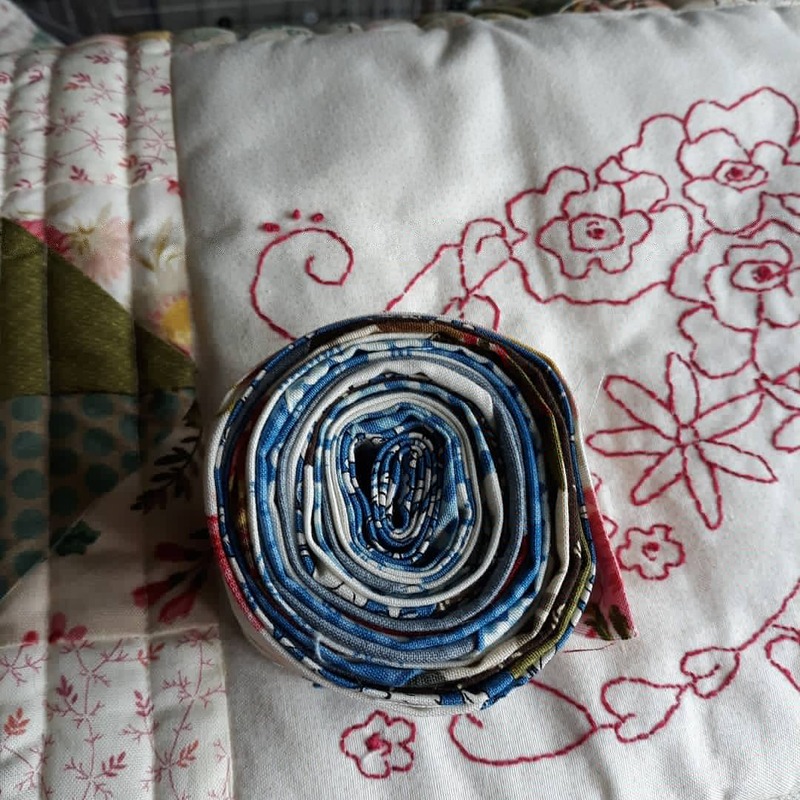 Thankfully there are lots of videos on Youtube showing you how to make scrappy binding – this is where you make your binding from scraps. Thank goodness my Creative Grids Stripology ruler arrived during the week, making cutting strips of fabric an absolute doddle. I then sewed by machine the binding onto the front, which included mitred corners – proper mitred corners not the bodge job I have done previously. 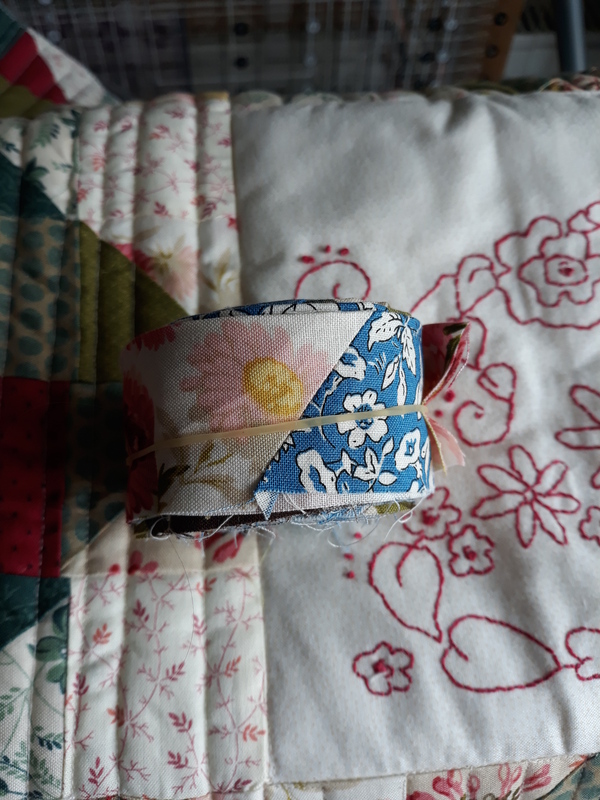 Then once the binding was sewn onto the front I pulled it over the edge onto the back and using clips held it in place whilst I hand sewed the binding to the back of the quilt. 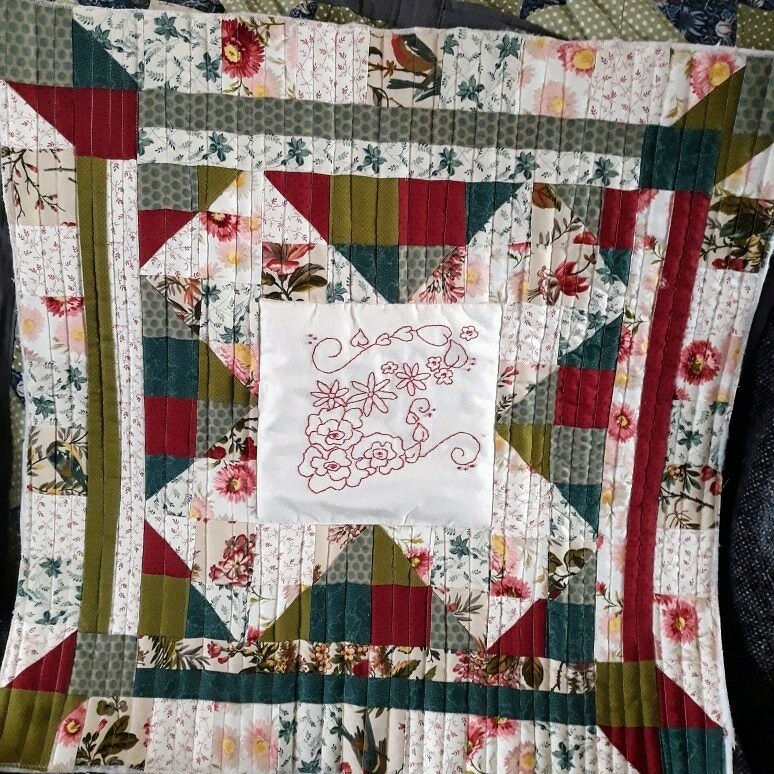 The hand sewing of the binding onto the back of the quilt didn’t take much time at all. 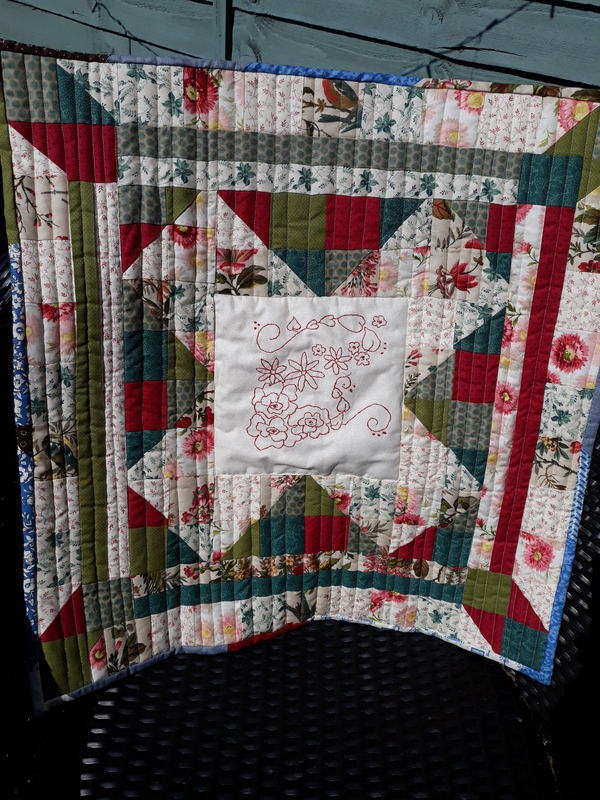 I made sure the stitches were really small so they are barely noticeable, it’s the neatest any of my quilts have been on the back. Finally the wall hanging has been completed, we now need to decide how we are going to hang it on the wall. It’s been a really weird week with my ears playing up, forgetting my tablets and ensuring that I have enough energy to make it through Wednesdays (6th June) course which is also my 10 month anniversary of giving up smoking, Thursday 7th June it will be 8 months since I started sewing, since then I have bought a further two sewing machines and an overlocker! Tuesday night the wall hanging was in situ! Jamie did a new video yesterday!